Free download Kung Fu Panda game free for PC. It is based on the original movie; it is published by Activision, a well known organization. The game was released in 2008; it is basically full of kung fu fighting game. Literally is a superb game. The kung fu fight of Panda will amuse you a lot, his attitude, his moves, his comic timing, all is great in this game. Above all these Kung Fu Panda 3d Graphics and sounds are out of this world. Kung Fu Panda game has good storyline, the game will start when Panda named Po became a Dragon Warrior under Master Shifu, he came across the city to save the innocent people from the dangerous foes. He lives in the village of peace of China, he always wants to become a kung fu master and he is a big fan and follower of the Furious Five. At the end of the quest, he became Dragon Warrior. Now the village of peace is being attacked by a strong enemy with his giant army. His village needs Po to find those foes, end their stories and bring the peace back to village. After that he got the name of kung Fu Panda a dragon warrior and back to the village. 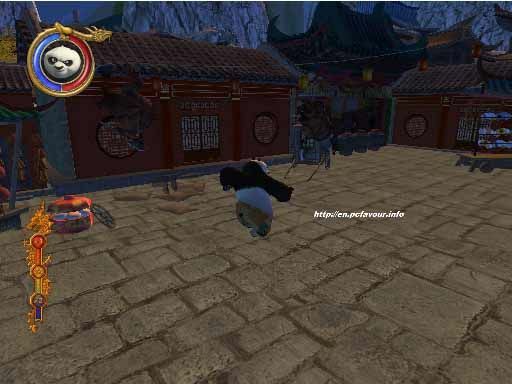 In Kung Fu Panda game, you will be act as Po and fight with your enemies. First of all you have to enter in the village with buttons w, a, s and d to move him towards city. You can have 3D cameras to see the clear view of battle with arrow keys. When you move forward you’ll got clues step by step, you have to press button ‘k’ to reveal that hint. You have different combinations to fight which can be j+k, j+j+j and many more. By default setting for fight is with 4, 5 and 6 keys but you can change it. Go to option and set it according to yours device such as Laptop and Desktop system. You have to protect yourself all the time and put a shield on yourself by press the key ‘Shift’. Nice one,please could you upload gta4?